Ever since last weekend I have been pestering my friends about something that took place and set my over active mind to pondering. I took the picture below at the excellent donut shop downtown that makes astonishingly creative pieces of fried dough. So much so the line wasn't moving as analysis paralysis overtook the customer at the head of the line. brought face to face with the fruit donuts, the chocolate donuts, the Key lime fluffery, so you can empathize with the difficulty of choosing. I leaned on my cane and waited. 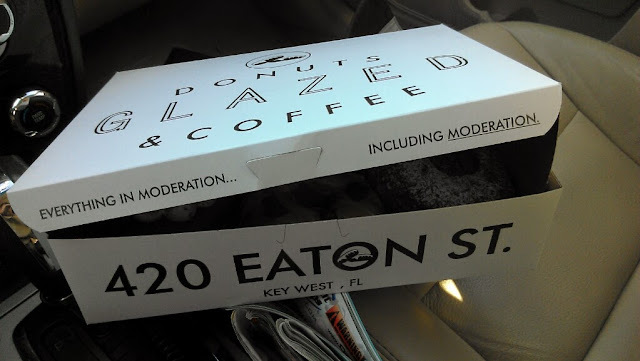 I was under orders to take home doughnuts to satisfy my wife's sudden unaccountable craving. And the whole shopping experience went to pieces. The surly dude behind the counter ignored my jocularity in regards to the infant he was carrying on his chest. He got mad when I slid the large tip jar aside to ease access to the credit card reader and then he had the effrontery to spin the computer screen toward me asking for a tip, you know the one where you chose 15 20 25 or more percent to add to your bill. I always over tip especially in the Keys where the cost of living is extravagant and the saying "if you can't afford the tip you can't afford the meal" applies more than most places. I added 20 percent while asking rather snarkily if he would smile for 25%. A smile, he replied equally snarkily, is no sign of interior happiness. It expresses joy to passers by I said. Besides he said if you lived in Key West you'd know there's no reason to smile. He should never have said that because that notion set me off. I looked at him and replied (I'm not proud of this but it had to be said): I've been answering 911 calls in Key West for 15 years listening all night to people in distress and last August a distracted driver killed me on Highway One and I still can't walk properly but I smile because a smile I hope makes the world a better place. And I turned my back on his startled expression slowly, so as not to lose my balance and limped out with my box of half a dozen doughnuts. They were excellent, I will miss them. What got to me was that he sells doughnuts for a living out of his own shop in Key West and does it successfully I guess, as they have been there for five years. And now he has a new born child and he is too bloody unhappy to sell his cakes with a smile? Just because he thinks I'm a tourist? It's donuts for heaven's sake! We don't need them; we buy them for joy, for fun, to celebrate, to be happy and the guy selling them has a chip on his shoulder the size of Mount Rushmore. Bummer. They are much more cheerful at Publix which is just one of several excellent bakeries around town. 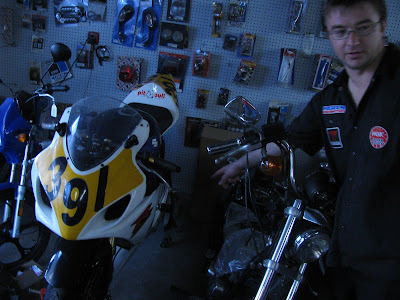 I stopped by my buddy Jiri's motorcycle shop during the week to have a chat and to smell the scent of powered two wheelers, so absent from my life at the moment, and the conversation turned to the donut fiasco. Jiri's perspective was a good one. He said you never know what the guy has been going through. He could have had a row with his wife, or just be beaten down by the strain of running a small business. Give him a second chance he said. Besides the donuts are good. Jiri has had his share of trials and tribulations in the shop which he used to share with a partner who went off the rails. His daughter lives in Michigan so he has to go up and visit her there if he wants to see her at all and he is a devoted father. But Jiri enjoys his life and nothing much gets him down. Anything is better than growing up under communism in Czechoslovakia is his bottom line. Besides he gets to go skiing in winter in Michigan and he loves skiing, so there's no accounting for taste! That weekend I also had some friends visiting from out of town and we went to Alonzo's on the waterfront for seafood. It's my favorite place for fish and it seemed to work for them. (I didn't bring up my donut pondering as they where on vacation). Steve had crab cakes and Cheryl had oysters and I had fish tacos on a lovely breezy fresh Monday afternoon. We talked travel and scooters and our server was a really nice woman who said she'd been working at Alonzo's for seven years which surprised me as I didn't remember her from previous visits. She was really good at her job but more than that she was warm and friendly and chatted with us as much as we wanted without being intrusive, a perfect balance and very professional. What made it interesting to me was how much joy this middle aged woman took in her life. A life that involves cycling across town to work to avoid traffic and parking issues, to a job she loves in a town she enjoys. If it was an act she should go on stage because she made the meal effortlessly memorable and cheerful. What a contrast with donut sad sack. It was nice for me to get the affirmation but it also helped me gain perspective on something that was bugging me. It really is okay living and working in the Lower Keys for all the difficulties and short comings and compromises we all live with daily. I was glad to show these visitors my town. That left me wondering why I was so affected by that brief unpleasant encounter. The answer I think lies in the notion that simply by choosing to live in this high cost, low service community you have some kind of right to lose your manners and I just don't think that's necessary. We all have bad days, God knows, but do you have the right to impose your aggravation on your customers? Then again: do I have the right to an expectation of cheerfulness? Were I in France. to throw out a negative stereotype, I might not be surprised to get surly service not because servers are surly but because in France being a waiter is a revered profession as odd as that sounds and professionalism seems to require a reserved attitude. Which to the American mind comes across as surly and we expect our less trained service workers to remember at all times the customer needs to be coddled with a smile. In our country we are trained to expect cheerful service, even in the 911 center where I work and sometimes we come up short; I know that. In a doughnut shop you'd think if life is getting you down someone else could staff the counter for a shift. You don't sell joy with a frown and being goofy while on vacation is to be expected. If dealing with gormless tourists bothers you don't get into the service industry. Maybe I have over-thunked this but I feel a certain resentment that just by virtue of living in Key West, a town two and a half million people choose to visit each year on their precious vacations, you have a right to feel put upon. I live in Key West so that justifies me being miserable. What a ghastly philosophy. At the same time I know Key West isn't the happiest place on Earth but it's not bad, surely. Is it so awful you can run a business saying I'm miserable because I live in Key West and your purchases aren't valuable enough to motivate me to fake a smile for two minutes to some smarmy excessively happy customer who thinks he's also buying some fake good cheer with his calorie laden artery clogging fried dough. How sad is it this millennial business owner thinks living here is irredeemably awful. I had no idea and the knowledge shocks me because I thought this was a pretty decent place to live and I feel lucky to be able to make ends meet living here. I wonder why he doesn't leave? 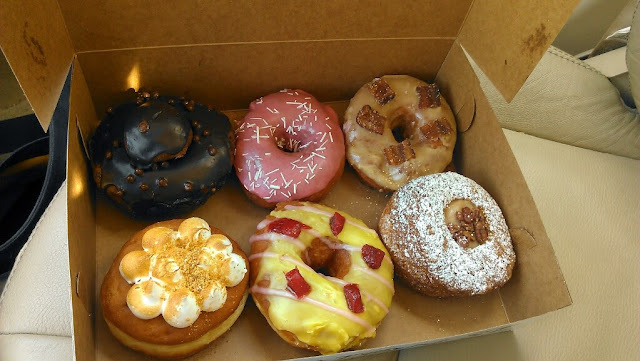 The gray skies of Seattle, the snow in Ann Arbor or the Maine coastal fog in Portland could all be alleviated by some powerfully tasty doughnuts. I'd hate living in those very popular places just because I'm allergic to the cold, but I'm the happy imbecile who found a home in the Keys. Lucky me and I'm still alive to enjoy it. You do the same wherever you are. Enjoy life and on the days when that seems impossible keep it together and wait for tomorrow.